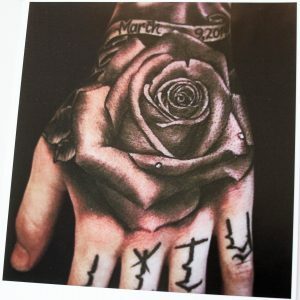 Rose, Black and Grey Realism by Bryan Wright. From classic Japanese to black & gray realism, no tattoo is too big for this ink master. Inland Empire based artist Bryan Wright, is stirring up the tattoo scene with his beautiful custom ink and one-year-old shop, Reflect Tattoo Studios. Located directly on Colton Ave. in Redlands, Wright is producing legendary masterpieces over unique canvases, paper and skin for the world to enjoy. In 2006, Wright decided to take tattooing seriously as a full-time job, converting himself into his elegant Japanese style and 3D realism. “I like big pieces, the flow and progress are important in my work,” stated Wright. Between Texas and California, Wright has brought home almost a dozen awards in various categories such as Best Black & Grey, Best Asian and Best of the Day. Many sea creatures and Koi fish can be found in Wright’s tattooing, giving a variation of meaning to a diverse set of clientele. “Koi fish are very strong and it takes a lot of energy to swim upstream” Wright said. 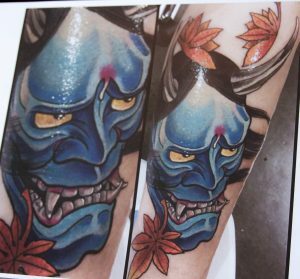 Traditional Japanese Mask Tattoo by Bryan Wright. Kabuki masks and flowers are a signature part of the Japanese culture and style, something that has become a substantial part of Wright’s clientele base over the last few years. This style has allowed Wright to take his creative ideas to a large skin canvases such as thighs, backs and chests, for huge multi-session works of art. Although this is Wright’s forte and specialty, his incredible talent correspondingly shines through in his realistic approach of flowers, skulls and three-dimensional designs. With his preferences on Solid Ink for tattooing and liquid acrylic for painting, Wright is confident in his quality and performance in every work of art. Using an ink with “thin pigment and buttery smooth texture” is a definite preference for Wrights’ daily workflow. In every stroke of the machine and brush, thought and energy is channeled into a state of concentration that is reflected in each individual tattoo and painting. “One of my favorite pieces I have every done was a geisha girl pulling a Japanese demon mask away from her face,” commented Wright. 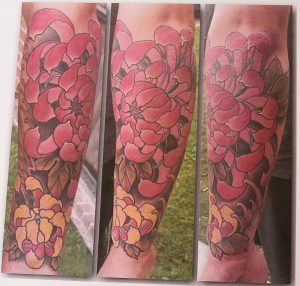 Forearm Japanese Flower Sleeve, by Bryan Wright. His future shines exceedingly bright with two new talented artists working at Reflect Tattoo Studios, new clients are traveling far and long distances to be graced by Wright’s hand. The diverse three-man crew is able to tackle any portrait, cartoon or Japanese piece that comes their way. With conventions and art shows on the rise, Wright has plans to host his own event in the upcoming future that justly depicts local artists looking for an outlet. When experience and professionalism are something that drives the choice of your artist, Wright happily holds over twenty years of artistry and more than a decade of tattooing in his arsenal. If engaging with a passionate artist on your next tattoo is what you desire, look no further than Bryan Wright at Reflect Tattoo Studios in Redlands California.